San Francisco, CA – BizBuySell.com, the Internet’s largest business-for-sale marketplace, reported today a record number of small businesses changing hands in the first half of 2018. The growth can largely be attributed to a growing number of Baby Boomers exiting their business as well as improving business financials. The full results are included in BizBuySell’s Q2 2018 Insight Report, which aggregates statistics from business-for-sale transactions reported by participating business brokers nationwide. A total of 5,383 businesses were reported sold in the first two quarters of 2018, putting the year on pace to surpass 2017’s record-high of 9,919 transactions. 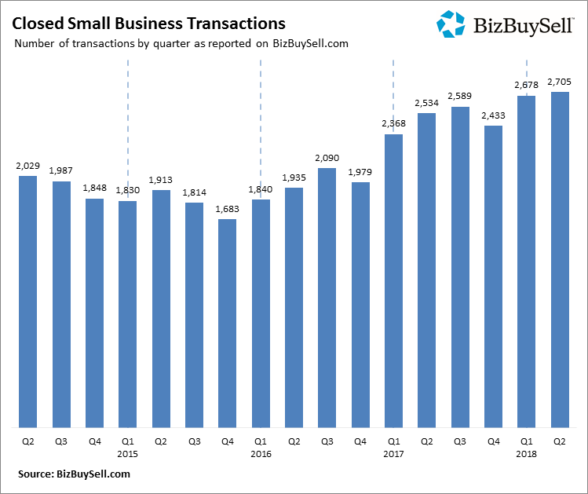 In Q2 alone, 2,705 businesses changed hands, an increase of 6.7 percent over the same time last year and the most of any quarter since BizBuySell began tracking data in 2007. The $526,048 median revenue of businesses sold in the second quarter reached a new high with a 7.4 percent increase from last year, while median cash flow grew 3.4 percent to $120,000. These stronger financials are catalysts for gains in asking and sale prices over the past year. Asking prices increased 4 percent from Q2 of last year to $260,000, raising the median sale price 4.4 percent to $239,000. While buyers are dishing out a little more at the negotiating table, BizBuySell data reflects a win-win for both parties. Sellers get a little extra cash from the deal, while buyers are taking ownership of businesses with better financial footing. The former is of special importance to the growing number of Baby Boomers relinquishing their business in turn for the reward of retirement. For those yet to take advantage of the hot market, for-sale data shows that it’s still an opportune time to jump in. A 5.1% increase in active listings were reported in the second quarter of 2018 compared to last year, extending a long trend that started in 2012. There are no guarantees in small business, however the state of the economy and demographic trends point to a rising tide. In fact, the National Federation of Independent Business (NFIB) small-business optimism index rose 3 points to 107.8 this past May, the second-highest level in the index’s 45-year history. According to BizBuySell’s latest demographic survey, Baby Boomers still own the majority share (53 percent) of small businesses. Demographically, these Boomers make up a fairly consistent group, with over 82 percent Caucasian males. Two in three Baby Boomers have owned more than one business and 68 percent have owned their current business for more than 10 years. More importantly for the market, nearly 60 percent of Baby Boomers plan to sell their business within the next two years or less. Based on this data, we don’t expect market supply to slow down anytime soon, but some data suggests we could see a shift in the makeup of incoming business owners. A deeper dive into the demographics of today’s market shows a transition to a more diverse group of business owners. Incoming buyers are less likely to identify as Caucasian (65 percent) than current owners as a whole (71 percent). They are younger, with the majority less than 50 years old and despite both groups leaning Republican, buyers are 25 percent more likely to be Democrats. Politically, immigration remains a hot topic in our country but its impact on the small business community is profound. A third of buyers are non-natural born citizens, and 64 percent of these are first-generation immigrants and another 16 percent are second-generation. That’s a big jump from non-natural born citizen current owners, in which just 48 percent are first generation and 10 percent are second generation. Finally, while women still account for the minority of small business owners (22%), female owner demographics showed a younger, more diverse group as well. For example, twice the percentage of female owners are in their 20s as compared to men. In addition, twice the percentage of female business owners identify as African American compared to men. Overall, the rising financial performance of small businesses and the influx of sellers ready to enter the market provide for an optimistic outlook of the rest of 2018. Sellers will continue to take advantage of high sale prices and buyers will be able to find quality businesses within the large supply of listings. Despite the favorable setup, external factors exist that could sway the markets trajectory. For example, it remains to be seen what impact changes to the U.S. immigration policy will have on the market over the long term. The same goes for the U.S. China trade war, where tariffs could have a direct effect on the small business space. In a potentially more favorable light, the Tax Cuts and Jobs Act passed in 2017 could cause the number of business transactions to further spike. Under the new tax law, many owners now benefit from a 20 percent deduction for qualified business income. If owners choose to re-invest those savings back into their business as early data suggests, the end result will likely be an increasing number of attractive businesses hitting the market.